SYDNEY, Nova Scotia - Luke Kirwan (Dewitt, N.Y.) scored two goals, including the eventual game-winning tally, and Jeremy Bracco (Freeport, N.Y.) registered three assists, as the U.S. Men's National Under-17 Team blanked Canada's Team Pacific, 4-0, here tonight at Centre 200 in the title game of the 2014 World Under-17 Hockey Challenge. Team USA has now captured the tournament title four times. 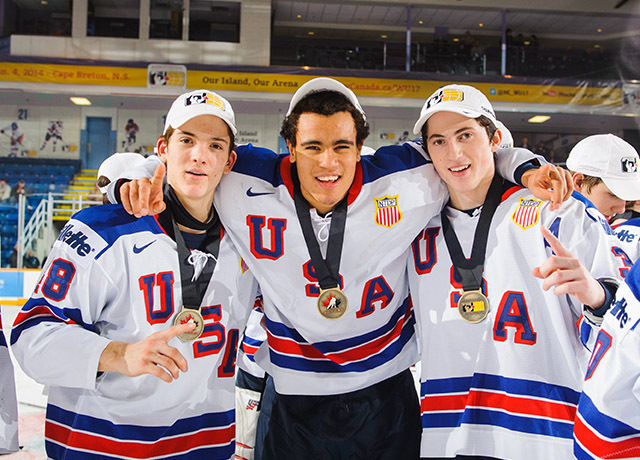 "This is a fun group of kids to work with," said Don Granato, head coach of the U.S. Men's National Under-17 Team. "We never lost focus throughout the tournament and continued to get better each game." Team USA opened the scoring 13:27 into the first frame when Kirwan beat Pacific netminder Zach Sawchenko. Bracco earned an assist on the marker. Christian Fischer (Wayne, Ill.) tallied a goal to double the U.S. lead 39 seconds before the period expired. Brendan Warren (Carleton, Mich.) connected with Auston Matthews (Scottsdale, Ariz.) who sent the puck toward Fischer. Fischer one-timed the pass into the far corner of the net. Colin White (Hanover, Mass.) scored just 33 seconds into the middle frame. After a quick breakout, Bracco skated the puck deep into the Pacific zone. White came streaking down into the slot and slammed a pass from Bracco past Sawchenko. Pacific appeared to have notched its first of the game with 6:12 remaining in the period, but the goal was waved off after it was ruled a Pacific player kicked the puck across the goal line. Team USA took a 3-0 lead into second intermission. Kirwan secured a 4-0 victory for Team USA at 11:34 of the final period. White and Bracco exchanged passes during a three-on-two rush before finding Kirwan in the high slot. Kirwan received the pass and shot it in one motion to send the puck under Sawchenko's pads. Michael Lackey (Washington, D.C.) stopped 12 shots for Team USA in the shutout win, while Sawchenko made 48 saves in the loss for Pacific. Jeremy Bracco was named Team USA's player of the game. Team USA outshot Pacific, 52-12. Team USA outscored the competition, 47-6, in six games over the course of the tournament. Colin White led all skaters in the tournament with 18 points (10-8) in six games played. Luke Kirwan ranked second with 13 points (7-6). Jeremy Bracco was tied for fourth with 11 (3-8) and Auston Matthews wound up ninth with eight points (4-4). Michael Lackey finished the tournament ranked first in both goals-against average (0.75) and save percentage (.958). Teammate Luke Opilka (St. Louis, Mo.) registered a 1.00 GAA (tied for second) and .927 save percentage (sixth). The U.S. has now captured first place four times (2001-02, 2010, 2014). Team USA also has four second place finishes (1999, 2008, 2011-12). The U.S. has placed in the top three for eight consecutive years (2006, 2008-14). No tournament was held in 2007. All 22 players on the roster come from the U.S. National Under-17 Team that is part of USA Hockey's National Team Development Program based in Ann Arbor, Mich.
For additional coverage, visit the NTDP Facebook page and follow @USANTDP on Twitter. The U.S. National Under-17 Team trains with The Hockey IntelliGym, a revolutionary software program that trains hockey sense. To learn more, visit USAHockeyIntelliGym.com.